Our researchers think Hidden-Peach Ransomware is not yet fully functional since it acts rather odd compared to other similar malicious software. Normally, these malicious applications encrypt user’s data and display a ransom note through which the malware’s creators try to extort money from the user. In this case, the infection does not show any message or lock any data, unless you have a folder with a particular name on your Desktop. If Hidden-Peach Ransomware is actually not yet finished, it should not be distributed widely. Of course, provided the threat is developed further, its creators could attempt to spread it among more users. Therefore, we encourage you to read the article and find out not only more details about this infection but also learn how to protect the computer from threats alike. Afterward, we recommend following the instructions placed below the text to erase the malicious application from your computer. So far it was reported that Hidden-Peach Ransomware is distributed with infected files sent via email. Identifying such malicious files is not as easy as it could appear to be. For instance, in some cases, users receive data that looks like text documents, invoices, photos, pictures, and so on. To make the files look even less harmless and more tempting the malware’s creators sometimes come up with a convincing letter, intriguing title, etc. Thus, it is no wonder some users download and launch these attachments without a second thought. If you do not want to make such a mistake, there are few tips to remember. For starters, you should never open a file sent through email right away without investigating it a little bit, especially if the attachment is sent by someone you are not familiar with. Firstly take a moment and think if this letter could be real, for example, from your bank, the shop from which you purchased some goods, etc. If there is a text with the file, study it carefully and see if everything makes sense. In situations when you feel the attachment might be malicious, we would advise you not to open it if it does not seem so important. Lastly, a good way to identify infected files is to scan them with a reliable antimalware tool. Having such software on the computer is most recommended because it could not only warn you about dangerous data but also stop you from accidentally infecting the computer. Usually, threats similar to Hidden-Peach Ransomware settle on the computer once the user launches the malicious file. Some infections do it by placing executable files, text documents, new folders, etc. There is also malware that creates Registry entries so it could relaunch itself every time their victims restart the computer. Afterward, they locate their targeted data and begin encrypting data valuable to the user. Since Hidden-Peach Ransomware is probably not yet completely functional is does not do most of the things we just mentioned. 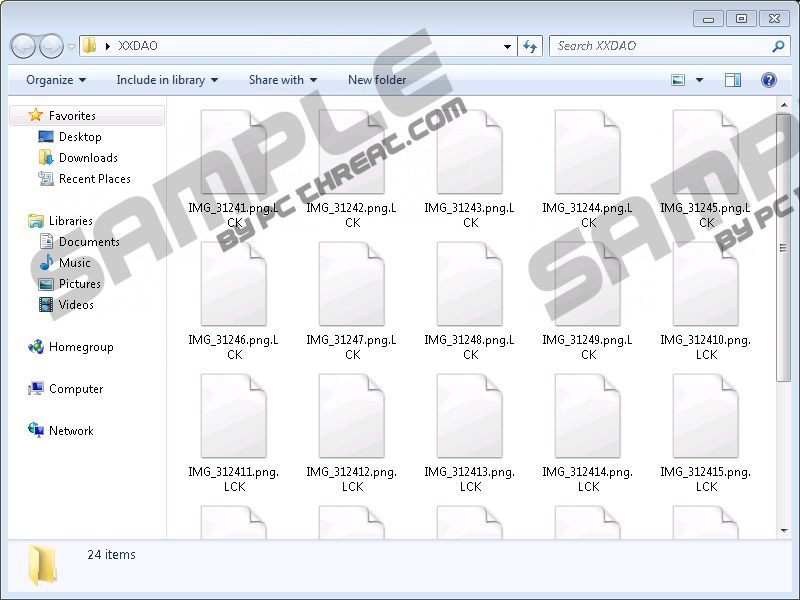 Our researchers say the infection can lock only data placed in a folder called “XXDAO.” It is most likely a folder the malware’s developers created themselves to test the threat, so for you to have a folder with an identical title would be a huge coincidence. Meaning, the malicious application should not be able to encrypt any of your files. Hidden-Peach Ransomware may not cause you any trouble the way it is now, but it could be finished in the future. If you ever come across a version of it that encrypts personal data and displays a ransom note, we advise you to look for a decryption tool created for a program named as Hidden Tear. This infection is based on it, so there is a chance the same decryptor might help you. However, if you encountered the variant that does not lock any files, there is nothing left to do but to erase the malware from the computer. You can remove it manually with the instructions placed a little below or delete it automatically after a full system scan with a reliable antimalware tool. Quick & tested solution for Hidden-Peach Ransomware removal.